Can there be too much piano? 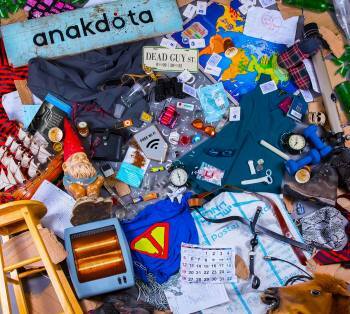 Anakdota; a five piece band from Israel have released their CD Overloading. Looking at the booklet of the CD the most noticeable is the absence of a guitar player. After the first listen it's obvious all the tracks are piano orientated. Even the use of a synthesizer is very limited. So, maybe there can be too much piano? After a few more times listening to the CD the beautiful structures of the songs and the excellent musicianship are a pleasure for the ears. The tracks are beautifully written and are moving from left to right, back to front. With every listen you hear new elements in the songs. Next to the excellent musicianship the diversity of the vocals give the songs a real boost. The band includes with Ray Livnat and Ayala Fossfeld a male and female singer. Where Ayala's vocals are beautiful in the ballads, Ray shines on the more heavier songs. Resemblance to Joe Jackson or Derek Shulman from Gentle Giant are the first ones that come to mind. Without doing a track to track review of the songs; a couple are worth mentioning. Late describes all the excuses you could have for being late. Where was this song when I went to high school? Staying Up Late for me is the highlight of the album. Sometimes there are songs where all come together perfectly. Take a listen for it yourself. With this excellent album I have to say “no”. Songs are well-written and so diverse that the absence of a guitar is hardly noticeable. Could this absence and the sparse use of synthesizers be a problem for the future?